1.Reserve half the strawberries and 1/4 cup each blueberries and raspberries. In large bowl, toss sugar and remaining strawberries, blueberries and raspberries; refrigerate up to 1 day. 2.Prepare pudding with milk as label directs; cover and refrigerate. 3.In large bowl, beat cream, powdered sugar and vanilla on low speed 2 minutes. Increase speed to medium-high; beat 5 minutes longer or until stiff peaks form. Gently fold whipped cream into pudding. 4.In bottom of 3- to 4-quart glass trifle dish, layer 1/3 of the pound cake; top with 1/2 of the berry mixture and 1/2 of the pudding mixture. Repeat layers of pound cake and berry mixture; top with remaining pound cake and pudding mixture. 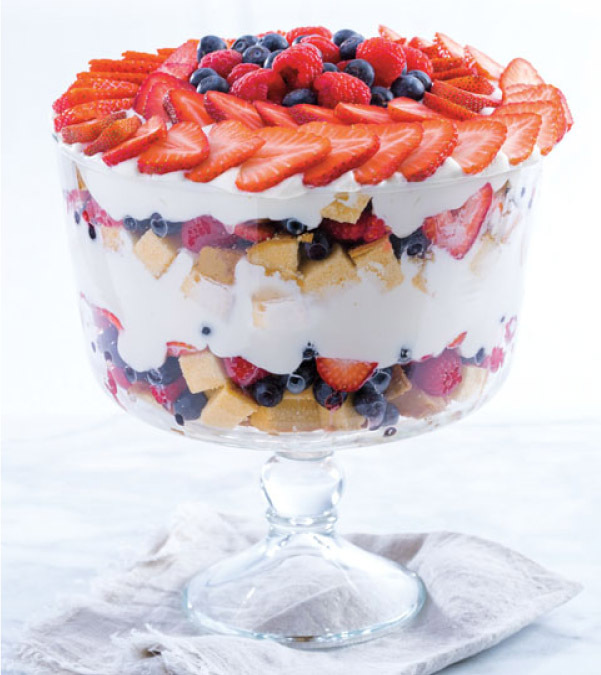 Arrange reserved strawberries, blueberries and raspberries on top. 5.Cover and refrigerate at least 2 hours or up to 4 hours. berries with sugar and prepare pudding, and refrigerate up to 1 day ahead.